Jim Douglas Morrison was, is still and will undoubtedly remain the greatest or probably one of the most distinguished front men ever in the history of "Rock and Roll". He was the lead singer and the lyricist of one of the most popular and respected rock'n'roll bands, The Doors. Morrison was born on December 8th, 1943 and had a distinguished I.Q. of 149 since his child-hood days. He had a very tough child-hood as he belonged a family who used to follow a strict military tradition called "dressing-down" where the child was consistently yelled at and badly berated till the time he acknowledged his fault or failings. Therefore his early life was a "nomadic existence typical of military families". Consequently morrison's education was greatly disrupted as he kept moving from school to school since he belonged to a naval family. Nonetheless, he proved to be a capable and intelligent student particularly drawn to poetry, literature and psychology. At the age of four years, he witnessed an accident in a desert where some native americans/ red indians were injured and killed. The following incident is reported to be the most formative event in his life where his thoughts drew towards humanity and other aspects of life such as sensations, feelings and emotions which can be seen in his poems and songs. He used to write poems and lyrics as his hobby, which were based on morals and other phases of humanity. Soon, he started singing his poems and verses which transformed him to an unusally rare, heavy-voiced singer. Jim completed his graduation at the famous film school UCLA in 1965 where he met his fellow band-mate and bassist, Ray Manzarek. Shortly thereafter, drummer John Densmore and guitarist Robby Kreiger joined-in to form a rock-band which they called as The Doors. They started playing soft rock'n'roll music with a wierd and rare style which gave them recognition at the local level. In 1967, The Doors achieved national recognition after signing with "Electra Records". The band's songs were Morrison's poems transcribed to rock beats which were either joyful, sad or depressed. The complex lyrics had a great affect on the listeners and consequently drew a heavy fan following for The Doors who became the heroes of rock'n'roll soon after. Morrison came to be known for his Baritone vocals, wierd acts and his famous leather pants which he used to wear in most of his concerts. His fans, journalists and scholars have referred him as a man of amazing theatrical stage persona where one could see him falling here and there on the stage during the concerts along with non-stop singing. He used to remain depressed most of the time on top of his success and un-ending fame which made him follow a self-destructive life-style involving heavy drugs and alchol. In the later years, he began to appear late for his shows, a result of drug-taking and drinking. He soon abandoned his leather pants and gained weight along with a heavy-beard which was an unusual image for a successful rockstar in those days. He apparently died at the age of 27 years in a bath-tub due to drug-overdosing. 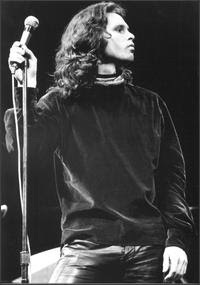 Morrison's death created a chaos and despair among the fans as a great legacy called "Jim Morrison" had come to an end. He is reagarded as one of the greatest poets ever. Some of his poems can be seen taught to children in nursery schools till today in America. He was also linked to famous women like Nico, Grace Slick and the greatest female blues singer ever, Janis Joplin on an alleged alcohol-fueled encounter. 3. Riders on the storm. 6. Love me two times. All your comments are welcome and i would like to heartily thank my best-buddy Pulkit(tiwari) for supporting and helping me like always and specially in the following post which is my first one as a Blogger. Thanks a lot pulkit!!!!!!! I have never heard any song of this band "The Doors"
I will try to search for their music now!